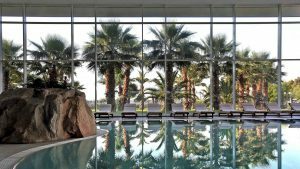 Escape from life’s hectic pace while staying at hotel Ivan by heading to the Spa & Wellness Mediterranean Garden. Dedicate a day to yourself for letting go of stress in our total relax zone, with heated indoor pools, sauna, a range of spa treatments and other features to nurture your health and well-being. 75 min. Natural sea mud treatment relaxes the body, soothes muscle cramps and relieves stiffness. It smooths localised, excess fat, and in combination with sea salts it removes dead skin cells. 50 min. A traditional ritual that includes the pleasure of a steam bath, a body scrub with Moroccan ‘Kesse’ gloves and a massage with olive soap. 90 min. A 100% natural multivitamin cocktail mask that nourishes, hydrates, relieves and restores the ideal balance and well-being of the skin. Freestyle back massage, and facial treatment with a mask of mixed grains effectively addresses stress, fatigue and exhaustion. 50 min. Strong and progressive massage. Reduces muscle tension through slow deep movements. Ideal massage for athletic types. 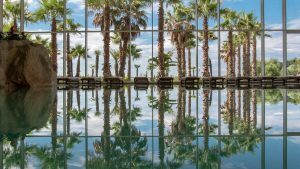 Our complex of indoor heated pools includes a 240 m2 salt water swimming pool, heated to a temperature of 28°C, with a depth of 130 cm. 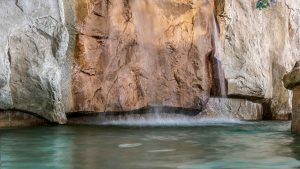 Also, there are three salt and fresh water pools with underwater massage jets, at 17 m2 in size and a depth 90 cm, with temperatures ranging from 30 - 33°C. At Mediterranean Garden we have 12 massage and treatment rooms and a private spa zone where you can indulge in signature massages, face and body treatments and spa rituals. For women, men and children. Our on-site, full service hair salon offers hair cutting, colouring, blow-dry and styling services, and also waxing, brow bar and nail salon services including manicures and pedicures. Salon services are available for women, men and children. This zone consists of: a 45 °C Hammam steam room, with special treatments available (maximum capacity 8 adults); a 50 °C chromatherapy sauna (maximum capacity 25 adults); and a 90°C Finnish sauna (maximum capacity 25 adults). A crushed ice bath is adjacent to the saunas, for a refreshing after-sauna ice massage. Within the same zone, you'll also find the heated relaxarium beds. We also provide a dedicated fitness zone for guests of Mediterranean Garden. In this cardio and fitness area, you'll find essential cardio and weight equipment to help you maintain your fitness levels while on vacation. The fitness zone is located next to the indoor pools. From the tranquil area of our Vitamin Bar, enjoy a variety of cleansing, healthy refreshments in the form of freshly squeezed fruit drinks, smoothies and a choice of wellness teas. On the opposite side of reception, our Wellness Shop offers the take-home purchase of our recommended professional products for face, body and hair care.